Did you enjoy the winter wonderland scenery in Amsterdam last week? Some international media certainly did. W ith the cold wave striking Europe last week, many cities were forced to cancel several daily activities such as classes and public transport, advising people to stay at home. 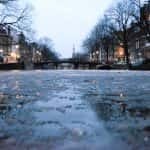 However, the frozen canals in the Netherlands proved to be a stronger force, bringing locals and tourists out to the chilly weather to take advantage of this incredible opportunity. Also international media, like the Guardian, found these freezing conditions in Amsterdam quite interesting. 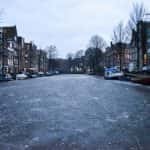 The last time canals froze in the Netherlands was during Europe’s 2012 cold snap. Just like back then, during this past weekend hundreds of people gathered around the main canals in Amsterdam. A few walked in with skates in hand, while others prepared their cameras to snap the perfect picture. Yet, everyone made sure to carefully take in the view while strolling from one side to the other, treasuring the experience of standing on what would have otherwise been moving water. The event even made it to international media outlets. After significant coverage on the negative impacts the cold wave had on most European countries, newspapers from all over the world regarded the frozen canals as one of the few enjoyable outcomes of the freezing temperatures. The timing was quite funny, because during the opening of the Olympic Games 2018, according to NBC ice skating was an important mean of transport in Holland. Numerous articles showcased photographs that perfectly portray Amsterdam’s residents and visitors’ excitement towards the condition of the historic canals that embellish the city, making it a worldwide newsworthy story. For example, BBC talked about ‘ice skating fun on Dutch canals’ and Time wrote about ‘the ice on the historic Prinsengracht’. The phenomenon was surely a good excuse to take a break from hiding under a dozen blankets at home and come out to enjoy the winter wonderland scenery Amsterdam embodied with its frozen canals.